photowannabe: ABC WEDNESDAY LETTER " U "
ABC WEDNESDAY LETTER " U "
Yesterday was an Unusual and Unique day in the Sacramento Valley. We had snow! It just doesn't happen here. I think that Mother Nature had the Urge to produce something Utterly special for ABC Wednesday since the letter of the day is " U ". Umber and grey were the colors of the morning. 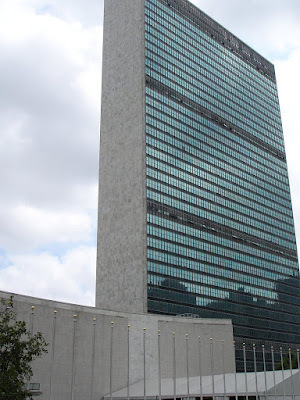 A few years ago, while working in New York, we rode by the United Nations building. We were Unable to visit it. The U.N. wasn't in session. You can tell because there are no flags on the flagpoles. This crane is Up way too high for me. It would give me an Upset tummy to be walking on the beam as the man is doing on the far left of the crane. To see him more clearly just click on the picture to enlarge it. Go to Mrs. Nesbitts link on my sidebar to see what others have posted for the letter " U ". I love how you incorporate your u's into your description! Great choices - great photos as well! Great post for the U day! Love your photos! And it seems that snow is not being as picky as usual as to where it will or won't fall! Beautiful post for letter "U". Unusual weather, beautiful photos as usual! Wow! Love this intrique entry! Great U's. I'll bet the snow was a surprise. There is none here at the moment but the temp is around zero - may be too cold to snow! The crane walker makes me a little woozy. Enjoyed your "u's" - it's amazing, isn't it that it snowed where you are and 100 miles plus up the road in our neck of the woods we have yet to see any snow let alone rain. Great photos as usual! I have an upset tummy just thinking about walking way up there! Cranes are way UP and my grandson is crazy about them, he's two and a half and thinks they are the coolest thing ever. Great post, quite the variety of U's. Very nice. I am waiting patiently for a lovely large fall of snow...great choices for U and really like your photos. Il est toujours aussi beau le bâtiment des nations-unies, avec toutes ces fenêtres, j'adore. It is always so beautiful building of the UN, with all these windows, I love. wonderful post. even snow is beautiful. We had snow on the hills around the Bay Area Monday. As you know, that is most unusual. UN-beleivable Post, U are ULTRA good at photography. i really like the shot of the tall building. Wow! Great "U's" for this week. And, snow! How beautiful and UNUSUAL is that! Hey, I did the UN! Snow is hardly unique in Albany, NY. All the schools were closed today; that WAS unusual, as there's usually one superintendent who will hold out. I have a friend in Grass Valley who has snow, too! Very pretty, but cooooold!! I love the crane picture! Wonderful post for U day! Nice shot of the UN bldg. And I love the shot of the man on the beam...glad its not me though. The snow looks very pretty...we only got rain. I hope you have recovered from the white surprise! Wow! You have snow already! Thanks for sharing your photos! And for visiting and your kind comment!